Eleven days of non-stop action on the sports field has sadly come to an end and today, 14 October 2010, saw Delhi bidding adieu to its beloved guests who entered as friends and will leave as family. 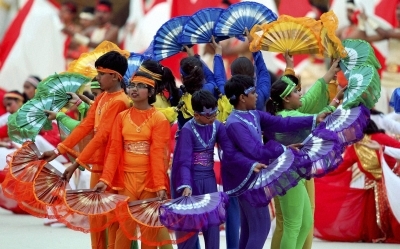 The Closing Ceremony of the XIX Commonwealth Games 2010 Delhi kicked-off at the Jawaharlal Nehru Stadium, the same place where the world saw the spectacular Opening Ceremony on 3 October 2010. The Closing Ceremony took-off with a preshow to the tunes of a local DJ followed by a short film on Incredible India! Mr. A. R. Rahman’s official video soundtrack for Delhi 2010 was shown to the 60,000-plus audience who erupted into a roar once it concluded. Mambo, the emcee for the Closing Ceremony, welcomed Delhites to the Closing Ceremony and also introduced the host of the day, Nitin Arora. Amar Jyoti, a school from Delhi was also welcomed on stage by Nitin Arora after which the students from that school performed to Bollywood numbers. Next on stage was Akshaypratishthan School, whose students too performed dances to popular numbers. Next up was Tara who entertained the crowd with her awe-inspiring voice. Hard Kaur, the well known female rapper, got the crowd to their feet when she belted out Punjabi rap. The victory ceremony for the Marathon that took place earlier in the day saw the proud winners marching into the stadium to the podium to receive their medals. The countdown to the show began and the audience cheered and joined in. Soon after, dignitaries from the Commonwealth Games Federation, the Commonwealth nations, the Government of Delhi and the Central Government arrived at the stadium. Delhi Meri Jaan was then played after which the show finally began with the emcee welcoming Mr. Michael Fennel - President of the Commonwealth Games Federation, Mrs. Sonia Gandhi, Chairperson UPA, His Royal Highness Prince Edward, the Earl of Wessex, Dr. Manmohan Singh, the Hon’ Prime Minister of India, and Shri M. Hamid Ansari, Hon'ble Vice President of India. The National Anthem of India was played after the guests arrived.